It was a warm, sunny day in Batad and I was sweating in my tank top and cutoff shorts. 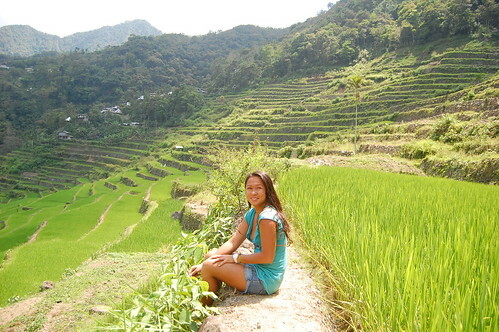 It wasn't exactly the best time to explore the rice terraces on our own, hoping to skip the "touristy route". My travel buddy and I had decided that DIY was the best way to explore this area. 30 minutes later, we were feeling dizzy from the heat and could hardly walk across the narrow paths between the paddies. So much for taking the path less traveled! Little did we know we were being observed. A teenager was watching us a few steps up the paddies. He was wearing only rubber slippers and a smile. He beckoned for us to follow him. He was quick to show us the easiest way around the paddies. Even though he was often too fast for us, he lead us to the best spots to marvel at the tiers of newly planted stalks of rice. He would patiently wait for us as we took photos. He often pointed to some interesting sights, a small stream that watered the rice, a clearing to rest or a flock of birds. Our time in Batad became more authentic and memorable because of one person- a local who took his time to guide us and allowed us to see the place through his eyes. After our little tour, we gave him some notes and thanked him for sharing his part of the world with us. A simple encounter with a local had amplified and enriched the value of our travel experience. Early this year, I was introduced to Withlocals, a website that connects travelers with locals through food and unique travel experiences. 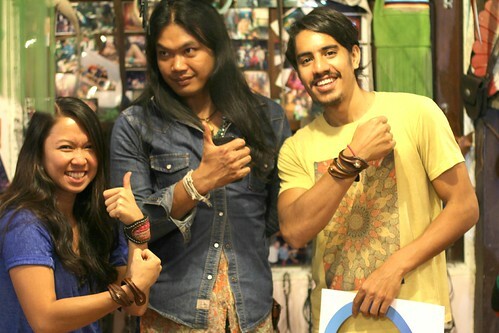 I met a Thai hippie, Aum who taught us how to make leather bags and bracelets in Chiang Mai, Thailand. But I didn't just learn how to make beautiful things from leather. I learned about all the hard work and creativity that an artist pours into each handcrafted piece. I learned the value of fashioning something by hand. I also learned about about the culture and political situation through the views of a local- all in one afternoon! You can imagine my excitement when I found out the Withlocals have recently introduced Eat, Tours and Activities in the Philippines! Their goal is to create unique dining and travel experiences for travelers. The Asian-oriented peer-to-peer travel marketplace expands to its 8th country, the Philippines. 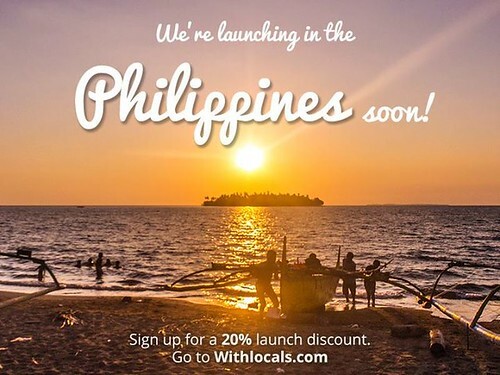 Launched in 2013, Withlocals is already a big hit in Indonesia, Thailand, Malaysia, Vietnam, Sri Lanka, Singapore and Nepal. 1 It allows you to experience a place like a local. It's the first platform to introduce the concept of “home restaurants” in Asia, offering travelers a unique local twist on dining at traditional restaurants. Travelers can also explore places that are off the touristy trail and are not easily found in a guidebook or travel blog. 2 We Filipinos get to show our love for country and can earn money through things that we are passionate about. We can share our favorite meal, show local hidden gems or impart our unique personal skills. This way, hosts can make new friends, earn money and be great ambassadors of the Philippines. So if you have talent in the kitchen, want to show off your local area or have a skill you want to share, you should become a host. Imagine hosting your own home dinner serving your famous mechado or lechon, showing travelers to your favorite markets and food stalls, or teaching them your number one skill from traditional fishing to jewelry making or martial arts. You'd have fun doing it and sharing that experience with others.